New Tots Bots Easy Fit Star, A Stuff and Go All In One Cloth Diaper! All NEW and in-stock at Diaper Junction! The Tots Bots Easy Fit STAR Diaper is basically an all in one, pocket diaper, but with the benefits of a two piece cloth diapering system. With the innovative EasyFit Star, the added efficiency is found in the innovative design of an attached liner (insert), saving Momma from the frustrating, time-consuming task of digging through the cloth diaper laundry to match up inserts with their diapers. 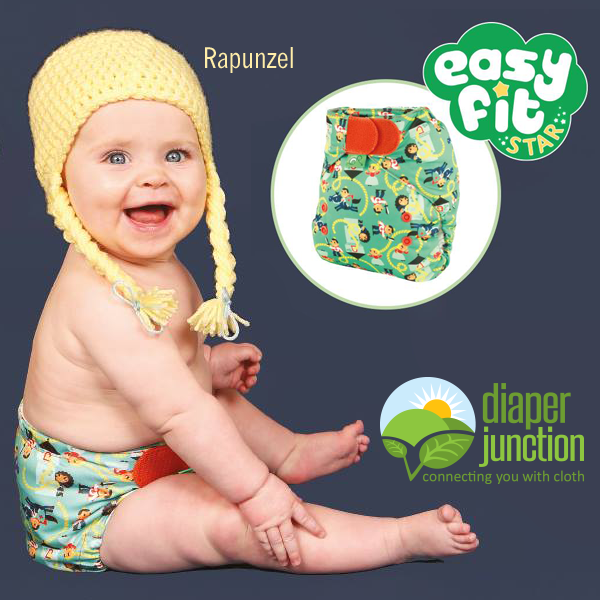 This week we have a brand new manufacturer authorized cloth diaper sale for you! 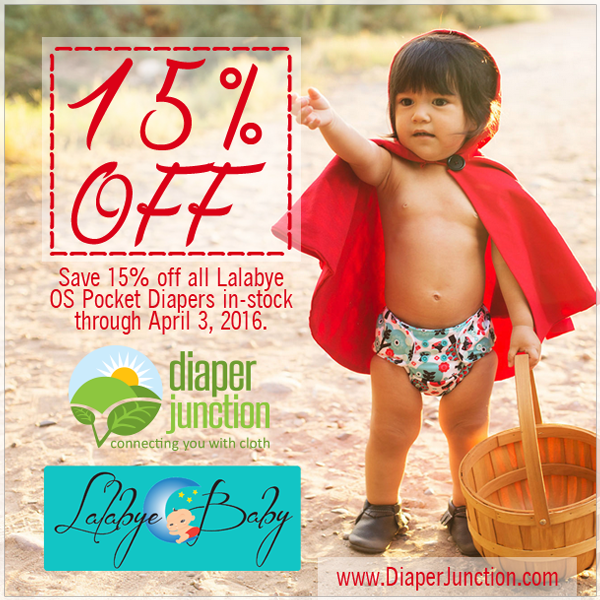 Save 15% off the popular Lalabye Baby brand of diapers. This cloth diaper sale only includes Lalabye Baby's OS Diapers and our stock at the moment is limited so act fast if you're interested in saving. 3/25/16 FYSF, Win a Julien Buttons Cover and Stay-dry Insert Set! 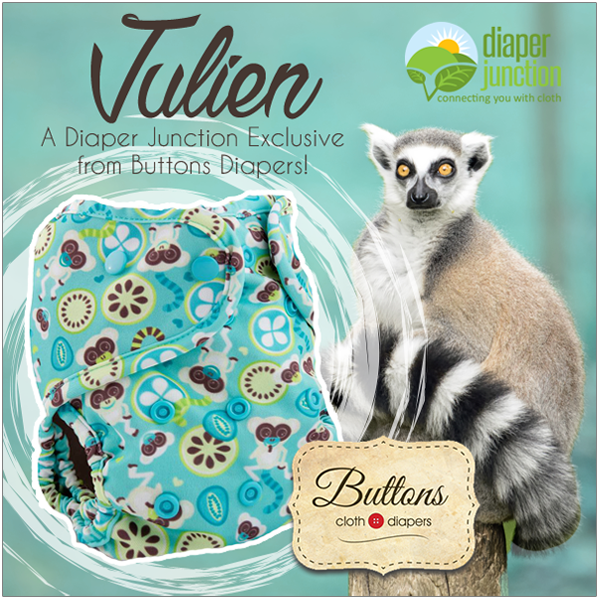 This week's cloth diaper giveaway features a BRAND NEW and EXCLUSIVE print to Diaper Junction, Julien by Buttons Diapers! Julien is a Diaper Junction Exclusive and in-stock only while supplies last. Meet Julien, a Buttons Diapers Exclusive for Diaper Junction! It's already time for another Diaper Junction Exclusive print! This time our exclusive print is from Buttons Diapers! Buttons is popular for their economical and adorable one-size covers and absorbent soaker pads. Have you had your eye on our popular Chesapeake Bay print, a new Pail Liner, Prefolds or perhaps a Cloth Diaper Package Deal? Well you're in luck! This weekend, for THREE DAYS only, we're offering FREE Shipping on every single item in our store! That's right! No matter how little, how big or how heavy your order is, it will ALL ship FREE! 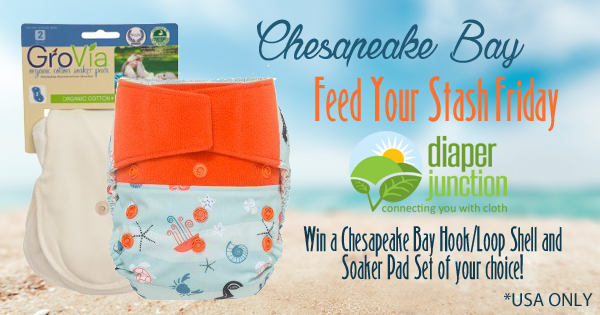 3/18/16 FYSF, Win a Chesapeake Bay Shell and Soaker Pad Set! This week's cloth diaper giveaway features our new and almost sold-out GroVia Retailer Collaboration print Chesapeake Bay! Chesapeake Bay, released Tuesday by Diaper Junction was a huge hit and we sold out of most style within the first few hours. Did you miss your chance to purchase it? Don't worry, you can enter to win it! GroVia Swim Diapers, New O.N.E. Colors and Zippered Wetbags have stocked! Our new inventory of GroVia products has arrived and is now available for purchase. What exactly is NEW you ask? Well some brand new products have stocked and other GroVia favorites have re-stocked in colors and prints not previously released in those styles. Chesapeake Bay, our Limited Edition GroVia print, has stocked! 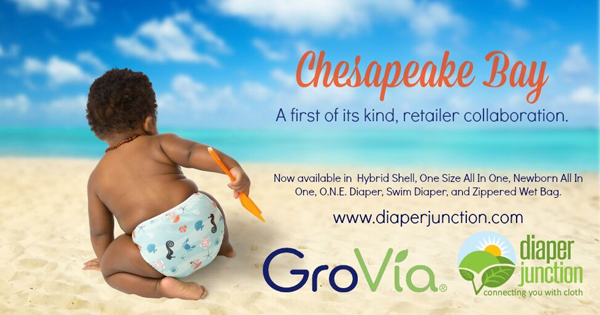 It's the day we've been waiting for, the day we revealed our GroVia Retailer Collaboration print 'Chesapeake Bay' to the cloth diapering community. It was an absolute honor to be the first retailer to collaborate with GroVia on a Limited Edition print. The process of creating our unique print was amazing and we couldn't be happier with the result. Dublin, Smart Bottoms NEWEST color, has just stocked! 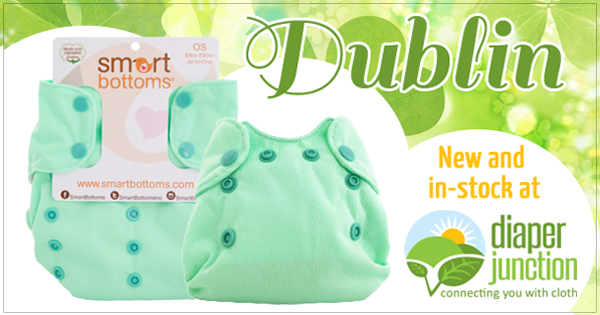 While it's not a special edition or limited time diaper, Dublin has just stocked in time for St. Patrick's Day! You'll love the contrasting light green mint color with complementing snaps. Dublin will make the perfect new addition to your stash and is sure to match those adorable Easter outfits as well. 3/11/06 FYSF, Win a bumGenius 5.0 OS Cloth Diaper & Wetbag! Today's new Feed Your Stash Friday Giveaway is a great one! Win the ever popular, tried and true, loved by moms, bumGenius 5.0 OS Pocket Diaper with bumGenius Wetbag! The bumGenius 5.0 is Cottonbabies recently updated workhorse diaper. The trim, bumGenius one-size pocket diaper continues to be a favorite of cloth diapering families everywhere. Fetching Friends is BACK! Pre-order yours by 3/11 @2pm EST. 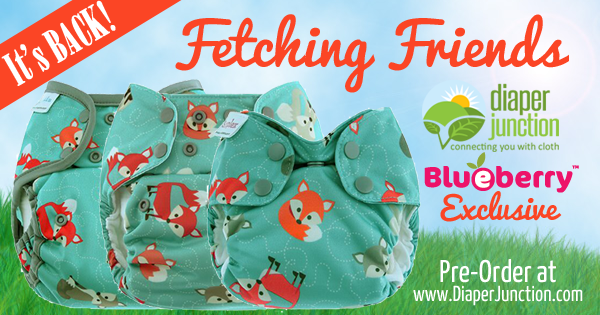 You might recall that Fetching Friends, Diaper Junction's own Blueberry Exclusive, recently stocked and sold out within just a couple hours. We were truly caught be surprise at how popular this new exclusive print was and fans expressed their interest in ordering long after we sold-out. We've decided to change things up a bit and offer a Fetching Friends pre-order so that no one who missed our original stocking has to miss out again or worry about having to stalk our site or wait online for our release. 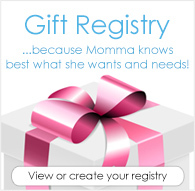 Enter to win another great cloth diaper giveaway from Diaper Junction! This week's cloth diaper giveaway, we prefer to call it a Feed Your Stash Friday giveaway, features the amazing BestBottom diapers brand! 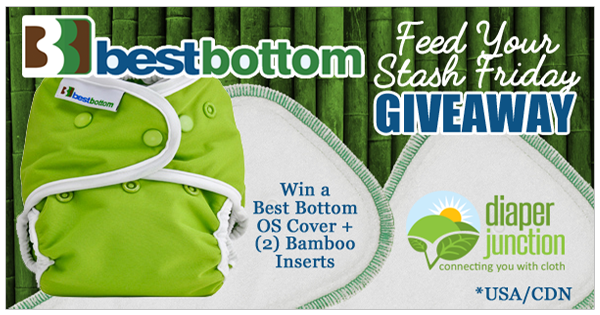 We're giving you all the chance to enter to win a BestBottom OS Cover of your choice and TWO BestBottom Bamboo Inserts, perfect for overnight and heavy wetters! 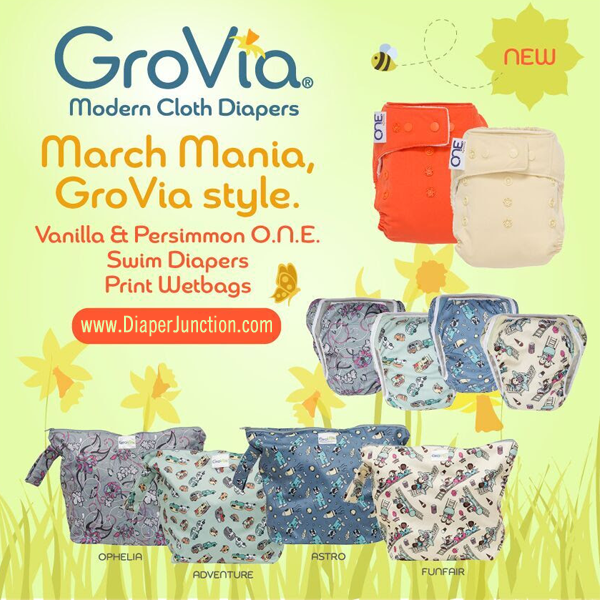 GroVia + Diaper Junction Collaboration and Reveal Event! Something so exciting is coming that we can hardly contain ourselves! 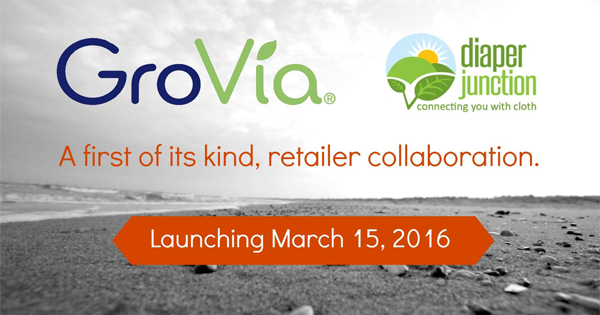 We've collaborated with GroVia for their first ever retailer collaboration and we just can't wait to reveal it to you! We've been GroVia retailers for years and they are one of our very favorite brands. We feel truly honored to have been given the ability to partner with them on this amazing print. Mums still the word, but we have created an exclusive event for those interested in witnessing the launch and unveiling. You are going to LOVE IT!